mangozac wrote: You know what? I find the shield to be kind of cool! One would assume it's supposed to be some kind of energy force field. Actually, I must say I'm starting to grow partial to the various Admech stuff FW is starting to produce. Must resist the urge to buy! (although I'm heading to the UK in June and planning to visit Warhammer World, so with FW right across the road I might be tempted to buy something...). Omnissiash is calling you. You know it for a while. Awesome. Where will you be going? Fleafa wrote: Awesome. Where will you be going? I'll be in London from the 2nd to 5th of June (then heading on a European tour). I'll be hanging with Arkangel for a couple of days and we're just finalising the plans for Warhammer World. I was going to post an announcement and see if anybody else wanted to meet up once we had thing finalised. Are you keen? I did some work on the chaingun last night. The barrels and muzzle are pretty much completed and I started sticking some styrene together for parts of the body but I'm still deciding on the layout. You can see the gattling mechanism motor and drive cover just the left of the barrel assembly. After looking at more pictures of machine guns and studying the firing mechanisms I think I've got a plan. It'll be fed by a drum mounted on the bottom of the weapon. I'm more of a fan of the two guns to bear; would a 180 degree swivel not be possible, allowing the weapon to be reversed? Yeah being able to swivel 180 degrees would be ideal, but being mounted so close to the body that's not going to be doable. Upon further thought they definitely need to be able to be both pointed forward and to do that I need a somewhat symmetrical design. Originally I wanted to mount the drum feed on the side, which would mean that it would be too bulky to mount next to the body without building two as mirror images. While not properly symmetrical, the vertical silhouette is close enough (which is important to ensure that the one part will fit on both sides of the torso). I've had to make a compromise and use a ball joint for mounting (which I was trying to avoid), but it's not too bad. Most likely, yeah. Could be fun. Talk more about it closer to the time. I don't like the idea of one side forward, one side back. Makes more sense for them to be able to pivot. If you swapped the location of the mount with the motor, they could rotate downwards in line with the legs, rather than outwards to the side. Would also mean the ejection port is always pointing away from the mech. Could you show us a current pic of the mech from the rear, looking up, focusing primarily on the area you intend to mount the chainguns to? Fleafa wrote: Most likely, yeah. Could be fun. Talk more about it closer to the time. You're right about the ejection port should face away from the mech - it's certainly not ideal to be spewing spent casings into the waist mechanics! I was aware of this but was hoping nobody would notice. The guys on WargamerAU pointed it out also so I don't have much choice but to do this properly, which means doing mirrored versions. I can use similar techniques for mirroring as I did with the main cannon (simply swap certain parts from side to side). At this stage I'm looking at putting the ejection port on the bottom, the magazine on the outboard side and the motor on the top. 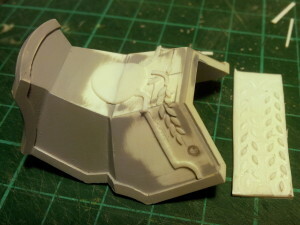 Then the mounting will be on the inboard side to the torso (rather than the top to the shoulder cylinder). Wow this beast is really coming along man, that gattling cannon is sweet!! While other projects have diverted some of my attention over the past couple of weeks, I have not neglected the Centurion! I've recently been discussing detailing of the chest armour with one of my close design mentors, Xeones, and we came up with a cool design based around laurel branches. The problem was that it required laying out some quite fine and intricate details like the leaves. I did a test one night with some leftover Procreate on some scrap styrene but the result was really poor. That was several weeks back and I decided it was easier to ignore it for the time being (and focus on other parts of the model, such as the Gatling cannon). With those other parts completed I had to get the chest armour completed. Use the CNC router to machine the shapes at a depth of 0.5mm into some 1.5mm styrene sheet. 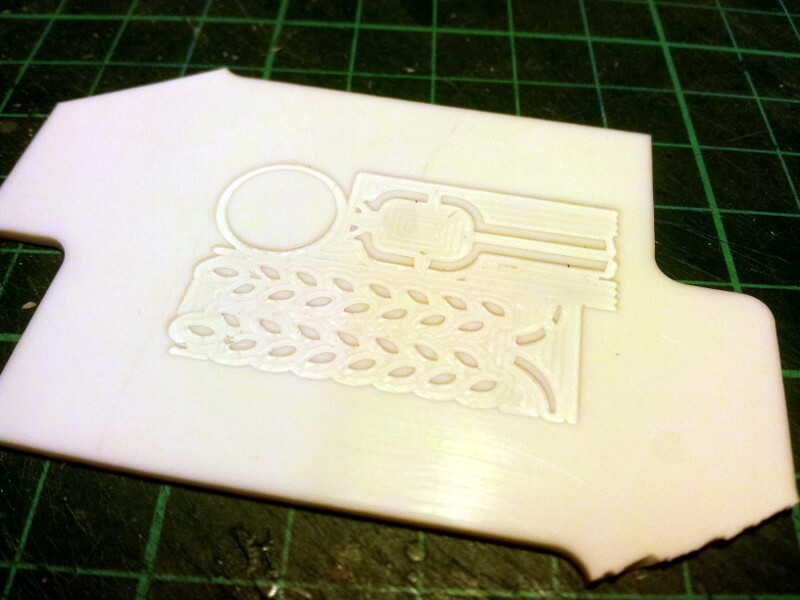 Areas surrounding the shapes would need to be milled down 0.5mm also. This effectively leaves a 1mm thick sheet with 0.5mm details protruding. It seemed feasible so I gave it a go. Here are the results half way through and I have to say I'm really pleased! The process of slicing the parts from the styrene sheet tends to curl them up a bit, but straightening them isn't a big deal. The edges are all a little bit crisp but some running around with sandpaper will sort that out. And here's the result. WAY quicker and easier than sculpting by hand! 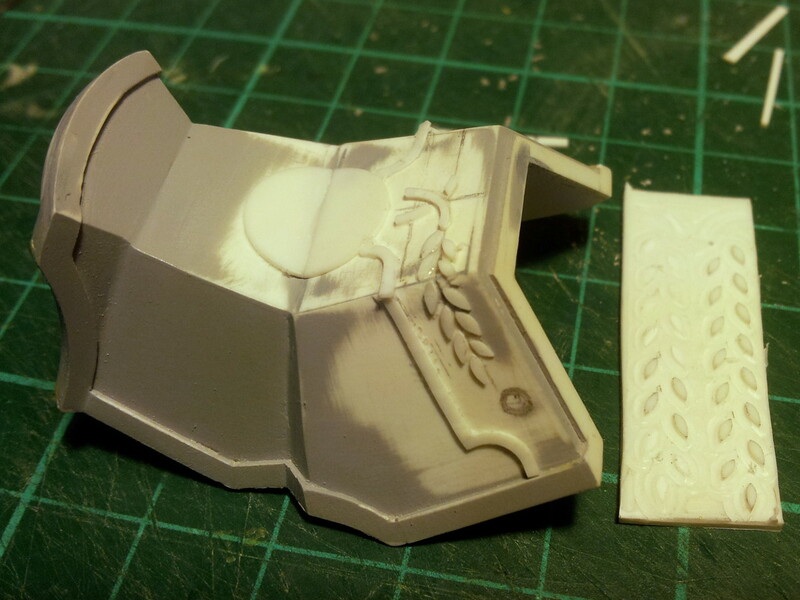 Once I've completed the other side I'll hit it with some primer and smooth things out a bit where necessary. Stay tuned! Man i wish i had one of those cnc tool thingies you have their. Good stuff on this, can't wait till it's dunzo! Blind: I'm not gonna lie, the CNC router is awesome to have. It does take a bit of knowledge to operate it though so it's not something that will make your work instantly a million times better. I'm often coming up with creative uses for it like this as a kind of hybrid tool, different to how it's usually expected to be used.